The musculoskeletal ultrasound allows the study of certain joints. X-rays are not used during this exam, but rather ultrasound is emitted by a probe in the form of short pulses. Your doctor may also request an injection (infiltration) in order to complete this exam. However, the decision to make an injection is up to the radiologist since it may not be appropriate or even harmful in some cases. This exam is for anyone suffering from pain or limited mobility in certain joints. N.B. These exams are available only at our private clinic Radiologie Montérégie (not covered by the RAMQ). 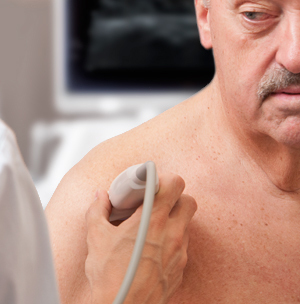 Note that not all joints can be properly assessed with ultrasound. We evaluate each exam request in order to provide the services best suited to your condition. We therefore invite you to send us your prescription by fax or email (please include your phone number). We will contact you to confirm the appointment. You will then be taken to the exam room. The radiologist will apply a gel to the area to be examined and will take pictures using an ultrasound probe. Sometimes it is necessary to take a position that can cause mild discomfort. Click here for the post-procedure recommendations.